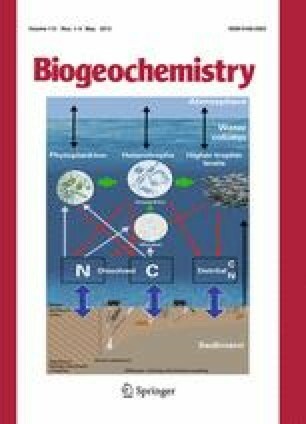 Benthic-pelagic exchange processes are recognised as important nutrient sources in coastal areas, however, the relative impact of diffusion, resuspension and other processes such as bioturbation and bioirrigation are still relatively poorly understood. Experimental ship-based data are presented showing the effects of diffusion and resuspension on cohesive sediments at a temperate shelf location in the North Sea. Measurements of diffusive fluxes in both spring (1.76, 0.51, −0.91, 17.6 μmol/m2/h) and late summer (8.53, −0.03, −1.12, 35.0 μmol/m2/h) for nitrate, nitrite, phosphate and dissolved silicon respectively, provided comparisons for measured resuspension fluxes. Increases in diffusive fluxes of nitrate and dissolved silicon to the water column in late summer coincided with decreases in bottom water oxygen concentrations and increases in temperature. Resuspension experiments using a ship board annular flume and intact box core allowed simultaneous measurement of suspended particulate matter, water velocity and sampling of nutrients in the water column during a step wise increase in bed shear velocity. The resuspension of benthic fluff led to small but significant releases of phosphate and nitrate to the water column with chamber concentration increasing from 0.70–0.76 and 1.84–2.22 μmol/L respectively. Resuspension of the sediment bed increased water column concentrations of dissolved silicon by as much as 125% (7.10–15.9 μmol/L) and nitrate and phosphate concentrations by up to 67% (1.84–3.08 μmol/L) and 66% (0.70–1.15 μmol/L) respectively. Mass balance calculations indicate that processes such as microbial activity or adsorption/desorption other than simple release of pore water nutrients must occur during resuspension to account for the increase. This study shows that resuspension is potentially an important pathway for resupplying the water column with nutrients before and during phytoplankton blooms and should therefore be considered along with diffusive fluxes in future ecosystem models. We thank the crew and scientists of the RV Endeavour (Centre for Environment, Fisheries and Aquaculture Science (CEFAS), cruise Cend 04-08) and Sue Atkins for all her help with equipment preparation. This partnership project was funded equally by the UK Natural Environment Research Council (NERC NE/F003293/1 & NE/F 003552/1) and Defra as part of the Marine Ecosystem Connections (MEC, ME3205) project.